Buffalo, N.Y., 2017-Apr-02 — /Travel PR News/ — Delaware North today formally introduced the Relay robot butler that is serving guests at The Westin Buffalo, the global hospitality and food service provider’s new 116-room luxury lifestyle hotel at its headquarters building in downtown Buffalo, N.Y. Designed and built by Savioke, the Relay robot, which became operational at the hotel in December, a few months after The Westin Buffalo opened, is the first to serve as a butler in a hotel in New York state, including New York City. It’s also the first robot butler with a unique focus on bringing guests various wellness items to their rooms – amenities offered through the distinctive wellness programs for which the Westin brand is known. 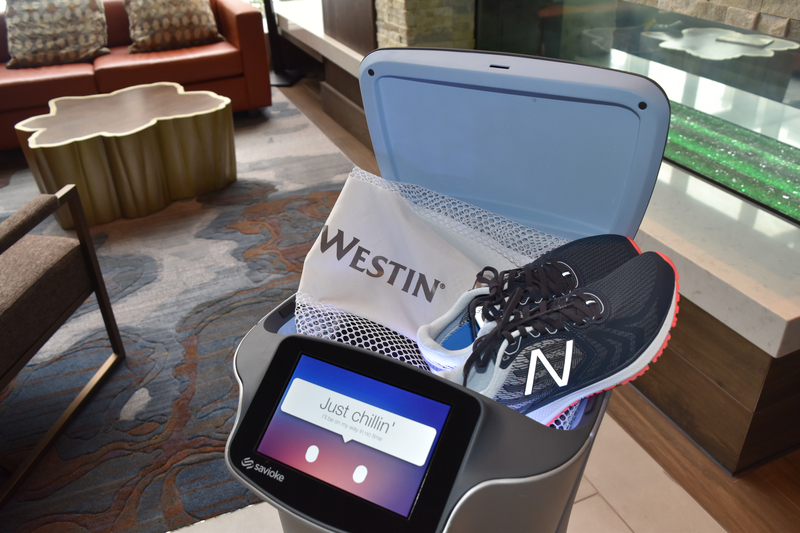 The robot delivers everything from delicious and nutritious SuperFoodsRx™ juices and other menu items from the hotel’s Jake’s Café, to running shoes as part of Westin’s Gear Lending with New Balance® program. With the running shoes and other items, even guests who arrive without their own gear can take advantage of the state-of-the-art WestinWORKOUT® fitness studio at The Westin Buffalo or the RunWESTIN™ program featuring jogging routes through Buffalo’s distinctive neighborhoods, new waterfront and architectural treasures. Relay is the first fully-autonomous delivery robot that works alongside people in busy environments such as logistics, hotels, office buildings, and high-rise apartments. Able to operate elevators, Relay is already deployed in dozens of properties where people live, work, and play. Using advanced technology to navigate in dynamic environments, around people and objects, Relay delivers items quickly, safely, and reliably – even in the most crowded locations. Since initial commercial deployment in 2014, Relay robots have made over 100,000 autonomous deliveries. Chip: This name pays tribute to The Westin Buffalo’s location on the corner of Delaware Ave. and Chippewa St. – one of the focal points of Buffalo’s current revitalization. It’s also fitting as the robot is powered by a computer chip. Sally: The first “first lady” of Buffalo, Sally Johnson was the city’s first mayor’s first wife. She was by his side as he designed his sprawling Johnson Cottage on the site where The Delaware North Building now stands. Grover: A reference to Buffalo’s presidential history. Grover Cleveland, the 22nd and 24thpresident of the United States, was once Buffalo’s mayor. Visitors can see their statues outside Buffalo City Hall, just blocks away from The Westin Buffalo. Silo: Buffalo’s grain silos hearken back to the 19th and 20th centuries, when the city was at the nexus of the country’s manufacturing and shipping industries. Today, the grain silos have been repurposed as tourist destinations along Buffalo’s waterfront. The robot will also be identified as a “Wellbot,” reinforcing its commitment to serving guests of The Westin Buffalo with the wellness amenities and programs for which the Westin brand is known. This entry was posted in Corporate Travel, Hospitality, Hotels, Luxury, Tourism, Travel, Travelers, Vacations and tagged Bernard Gay, Delaware North, Relay robot, robot butler, Sally Johnson, Savioke, Steve Cousins, SuperFoodsRx, The Westin Buffalo, Tom Long, Wellbot. Bookmark the permalink.